just by looking at its bright yellow flowers. specifically in SAD or (Seasonal Affective Disorder). Many of us feel a mild depression during months of shorter daylight. When there are shorter days, there are fewer nourishing neurochemicals that give us our sense of well-being. The National Institute of Mental Health in the United States says that SAD affects 10 million people in the US, but that it is usually mild and short lived. St. John's Wort has been used in the treatment of psychiatric conditions since the early nineteenth century, but in more recent years, synthetic antidepressants have been more widely used. Prozac is a commonly used antidepressant but in Germany, St. John's Wort remains more popular. Some studies published in the British Medical Journal (1996) concluded that St. John's Wort has antidepressant properties, particularly in mild to moderate cases. 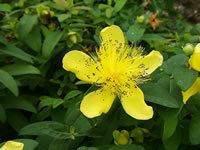 St. John's Wort was shown to be just as effective as prescription antidepressants without their side effects. According to the World Health Organization, depression affects 3 to 5 percent of the population. We know the symptoms: faiding of mood, lack of interest in normally pleasurable activities, disturbed eating and sleeping habits, low self-esteem, indecisiveness, irritability, fatigue, and hopelessness. St. John's Wort contains dozens of active ingredients, such as hypericin, pseudohypericin, protohypericin, and hyperforin. Because of these active ingredients, it is wise to purchase liquid drops, tablets, or teas so that these ingredients are controlled. Always follow the directions on the package and check with your doctor before taking any herbal medications. Some of the phytochemicals in St. John's Wort are believed to be helpful in HIV, the virus that causes AIDS, and in the topical treatment of herpes viruses and first-degree burns, cuts, and wounds. Research continues into the use of St. John's Wort in easing the pain and swelling of arthritis and fibromyalgia and the discomfort associated with menopause. St. John's Wort can cause photosensitivity or sunburn, especially in fair-skinned people. 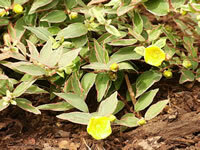 When using St. John's Wort, wear sunscreen, and avoid overexposure to sun or ultraviolet light. Pregnant, lactating women, and children should consult with their doctor before starting to use this herb. 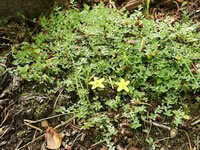 As with other MAOI antidepressants, alcohol should be consumed cautiously when taking St. John's Wort. It contains analgesics and may interact with the alcohol. Caution should also be used when eating pickled, smoked, or aged foods as well as with certain cold and hay fever remedies, amphetamines, tryptophan or tyrosine. Always work closely with your doctor if you plan on taking St. John's Wort and are currently taking any synthetic antidepressants like Prozac or Zoloft, the dosage may need to be cut back. Too much serotonin can lead to serotonin syndrome, which is characterized by symptoms such as fever, chills, sweating, and difficulty with speech.